Our conversation happened over a couple of weeks between year-end concerts (Beth plays percussion), end-of-term busyness (Sue’s a CEGEP teacher), grocery shopping (Beth), tending to sick kids (Sue). Both of us enjoyed the process. And both of us are very much looking forward to reading the other’s shortlisted book. 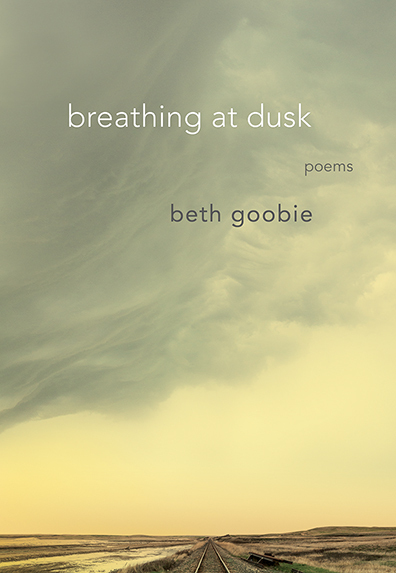 BETH GOOBIE: Susan, how does the structure of poetry affect how you perceive the world, or how you interact with other people and the world? SUSAN ELMSLIE: That’s a really interesting question. I think that I do see my world as poetry-inflected. Though most of the time, like most of us, I think, I also live in prose—the workaday language of the daily grind. But when my senses are especially heightened because of increased vulnerability or receptiveness to the world, I see my daily rounds or my memories as scenes or as poetry-drenched moments. When I begin to imagine an experience as a poem, I start to wonder about what form it might take, what formal structure best suits this subject or poetic inquiry. For instance, in Museum of Kindness there’s a poem about my experience of PTSD following the shooting at my workplace, and pretty soon after jotting down some of the images that I was steeped in, I sensed that a suitable form for this poem about traumatic recurrence is the palindrome, and so I worked with that form. There’s something very satisfying to me about patterns and structures, and part of what motivates me as a reader of literature, and poetry in particular, is the pleasure of pattern recognition. I also think that poetry—reading it and writing it—has made me more receptive to the world and to others, more interested in process and in the imperfections that make us human. SE: Adrienne Rich wrote that using a strict poetic form to write about difficult material could be like picking up something toxic with gloves on. Beth, what is your relationship to form? How do you find ways of approaching your enormously difficult material? BG: I have one basic way of approaching every poem I write: I sit and wait, and in silence and solitude something takes its own form and begins to speak to me. So it is the poem that chooses its form, not “me” — whoever me is. I don’t use any of the predetermined poetic forms. What I like most about poetry is that every line is completely open to going anywhere. With fiction, you narrow your choices as you proceed through your narrative; with poetry, the choices are equally sky-wide from the first to the last line. I like to think that not only do I write poems, but I am a poem; each day of my life is equally open to new choices and perspectives. In terms of my relationship to form, I have spent a great deal of time in the past three decades meditating, which, in my experience leads to a dissolution of established thought form and a clearing of negative energy. This leads to a greater free flow of thought and creativity, less rigidity of soul and mind. Helpful in ever so many ways. In 1994, I stopped watching all visual electronic media, because I felt as if it was/were (not sure which word is correct here) constipating my mind. This did clear out that mental bloated feeling, and I’ve stayed away from TV and movies since. BG: What are your methods for getting past that level of white static in your mind … and in your reader’s mind? SE: Thanks for your thoughtful answer to my question—it makes me want to clarify something before answering your next question: while I do use some of the pre-determined poetic forms, I too believe that it is the poem that calls for its appropriate form, whether that is a so-called fixed form or an open form. I try not to impose a form that seems to be at odds with the treatment of the experience or the raw “material,” unless that gets me closer to the crux of the experience. For me, all art is artifice. I’m not sure I ever get past the “white static” of contemporary life. I do consume media: news, films, some TV series, documentaries, books, shelter magazines, social media, old photographs. I get lost in the rabbit holes of the internet, drawn especially to history and culture sites. Such stuff sometimes inspires poems—I recently wrote a “Clickbait Sonnet” complete with live links, which is a bit of a departure from the sorts of poems in Museum of Kindness that, for the most part, develop from more personal experience. As well, in my home life, I live with fairly constant noise; my son has autism, and he is mostly non-verbal but likes to vocalize (scream) and is hyper-active and likes to stomp and jump, often even in the middle of the night. So it is fair to say that I am frazzled and sleep-deprived a lot of the time. I have tried and failed to meditate. But I find that poetry is a meditative space for me, where I can take as much time as I need (in relatively small, furtive snippets of time), to examine the self and the world closely and quietly. And the white static in the reader’s mind? I think of the reader, and I hope that we can meet on the page. The best I can do is try to craft my poem as carefully as I can and to be intent in my gaze, and to get to the “truer than true.” And then, to be exacting in revisions and also work with a good editor (my editor for Museum of Kindness is Alayna Munce, whose eye and ear I trust). SE: I have three questions for you now. Do you read the news? Do you have a first reader who you trust to read your poems when they are still new/raw? Do you revise very much, or do the poems come nearly fully-fledged? BG: I get all my news via CBC radio, and so I never know how to spell surnames or place names. Occasionally, news events inspire creativity. For instance, my last YA novel The Pain Eater, was “inspired” (if that’s the word for it) by the trial results for the two young men who offended against Rehtaeh Parsons. Other news events that have inspired poems were the Montreal Massacre and the Harper government’s decision to reduce social funding on reserves, several days into the 2012 Olympics, because no one would be paying attention to the news, which continues to disgust me. A first reader? The short answer here is no. I’m not collaborative. Writing is the way I saved myself from insanity; it’s how I remade and continue to remake myself. So it has to be mine, exclusively. But I attend Tonight It’s Poetry — a weekly open mic/poetry slam series held here in Saskatoon, and these Sunday nights inspire me to write. It changes my poetry too, as I’m writing for an audience who’s listening rather than reading — makes it simpler, more direct. Do I revise very much, or do poems come nearly fully-fledged? The poem that births itself complete into my mind is a rare and precious experience. It has happened — once or twice in 25 years. I’m looking forward to the next one, but not holding my breath. BG: Here’s your next question, Susan: Some publishers are no longer publishing poetry collections. Do you think poetry is still a vital form of expression? Why? And why doesn’t it sell? But Szymborska’s closing image of the firm mystery of poetry as “redemptive handrail” also suggests its power. Two other things I’d like to say about poetry as a vital art: it flouts the standard practice of a market economy. As I write in my poem titled “Poetry” in Museum of Kindness, “Can’t pay someone // to do it well,” and that includes the publishers whose production of poetry books is pretty much a labour of love. Finally, it may be the only art you can apprentice in for free, and that’s likely why it is my chosen art. I grew up on social assistance; my mother could not afford formal lessons of any kind. But the library is free, and people discard books that you can pick up for free. No other materials are needed: Anyone can compose and memorize poems. It’s a very accessible and democratic art. SE: Is there a book of poems or a single poem by another poet that was formative to you as a poet, or that you return to, that really speaks to you where you live? BG: It’s Dylan Thomas’s poem “Fern Hill” — specifically the phrase “the house high hay” which hit me like a thunderclap in my first year English course at the University of Winnipeg. The way those four words encapsulate perspective opened my understanding to the way language can work. I was talking to a fellow poet at a poetry slam this past Sunday — she’s a Stephen King fan, hates wordy descriptions of landscape, etc. she WANTS TO KNOW WHAT HAPPENS. Me — I like to meander through gorgeous language, what can I say? The plot can wait; I need my word fix. 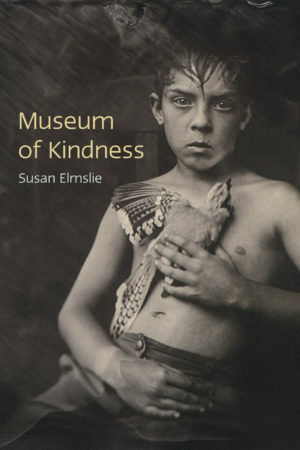 Susan Elmslie’s Museum of Kindness is shortlisted for the Pat Lowther Memorial Award, along with Beth Goobie’s breathing at dusk.